Take one large slice of favorite local pub, wrap it in a touch of class and drizzle with great flavor and you’ll have a sense of what you’ll get at Kuni’s. The place is very casually walk-in and hang-out with a beverage until a spot opens up type of place. It’s such a neighbor relaxing atmosphere that no one seems to mind. I think what I find so intriguing is the perfect balance struck between Japanese cuisine and Elmwood village casual. It makes for such a great combo I can’t wait to get back. 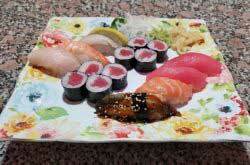 Kuni’s is owned and operated by acclaimed sushi expert Kuniyuki Sato, a pioneer in Buffalo Sushi. The original Kuni’s was once a bustling enterprise on Elmwood Ave. So much so Mr. Sato closed, took a year off to pursue other interests, and opened up the current Kuni’s a year later. For more information on Kuniyuki Sato read this article from 2007 on Buffalorising.com. Starting with a glass a of Mark West pinot and a two minute wait before we were seated, we immediately ordered the appetizer special salmon sashimi with onions and a vinaigrette. Next we went with a Japanese Slaw – Julienne-style Napa cabbage, daikon radish and carrots tossed with a plum dressing-$5, Grilled Baby Octopus with chili sesame oil served on skewers – $8, the small sushi platter (chefs choice) that came with yellow fin, flying fish eggs, salmon, shrimp, mackerel, Fluke, and tuna rolls – $18. Just to say we tried it we ordered a single sea urchin sushi for $4. As described it was oddly creamy and a little fishy. We ordered in stages because the menu is long and interesting. This is not a one glance and go list of food, unless maybe you’re a regular. The sushi was as good as I’ve had anywhere. I’m no expert but I know what I like. Fresh and well presented, it was delicious start to finish. Next we sampled the Tonkatsu – panko crusted pork, fried and served with a sweet brown dipping sauce – $12. This dish seemed out of my limited notion of Japanese, but it was mighty satisfying. Crispy, juicy pork with a luscious sauce is a winner every time. I like the fact that they have more than just raw seafood. See the specialties menu for various cooked dishes. As one person mentioned on whiner.com parking is limited to neighborhood streets. If you can’t manage the trip around the block or down the street you might think twice. Beverages- they offer a long list of different saki, interesting beer options with some Japanese, local craft and Canadian choices. The wine options are few but good quality. Items to return for: See everything on the menu. In truth I like everything about this place. 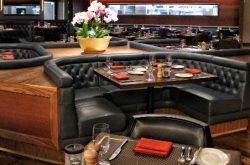 Food, drink, atmosphere, menu, service, style…even the prices are good. I think it’s my new favorite go-to spot.